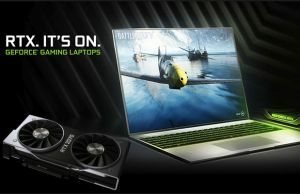 The GeForce MX250 is Nvidia’s entry-level dedicated graphics chip, bundled inside mostly thin-and-light ultrabooks and affordable full-size laptops. 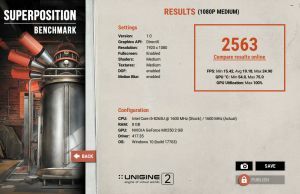 It’s designed to improve on the performance of Intel’s HD integrated chips you’ll usually find on this kind of computers with casual gaming, productivity tasks like video/photo editing and other GPU dependent software. We’ve covered the MX250 chip in a previous article, where we also compile a detailed list of all the MX250 laptops available in stores. 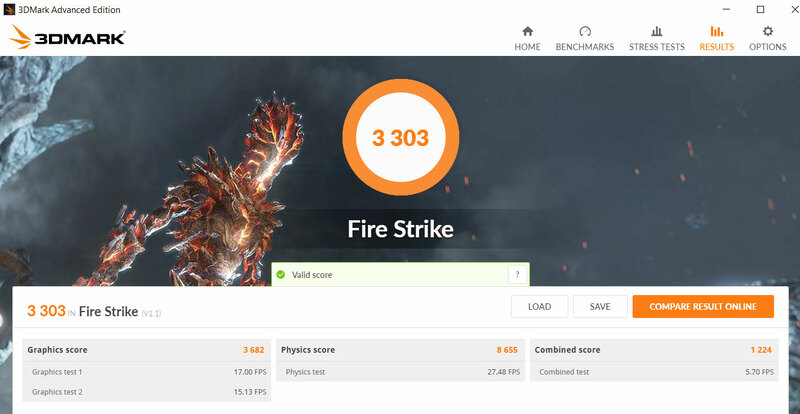 In this post, though, we’ll have a look at the chip’s performance inside one of the first devices available with the MX250 GPU that we got our hands on. 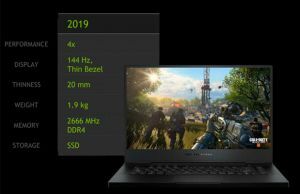 Our experience is based on the Acer Aspire 5 A515-54G, an affordable 15-inch notebook, in a configuration with a Whiskey Lake Core i5-8565U processor, 8 GB of DDR4 266 MHz of RAM and a 128 GB SATA M.2 SSD, as well as the 10DE 1D13 variant of the MX250 GPU. 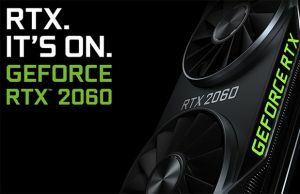 Just like with its predecessor, the GeForce MX150, Nvidia offers two versions of the MX250 GPU, a higher power variant meant for full-size laptops, and a lower-power and more efficient option meant for ultraportables. As far as I can tell, but take this with a grain of salt, the 10De 1D13 is the former option and a direct followup of the MX150 10De 1D10 25W chip. 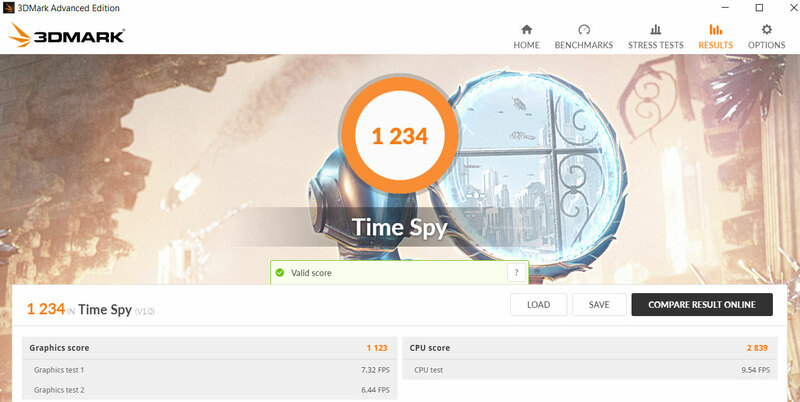 You should keep in mind that our findings below are based on an early production variant of the Aspire 5, with immature drivers (GeForce 417.35), thus the performance might improve with later software updates. On top of that, the cooling design and its capacity to keep the hardware in check is going to greatly impact the performance of MX250 laptops, and the Aspire 5 implements a basic cooling solution with a short heatpipe and single fan for both the CPU and the GPU, and we’ll talk about its impact further down. 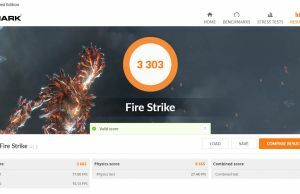 For now, though, here are a few GPU benchmarks of the MX250 2 GB 1D13 and how it compares to the older Nvidia MX150 and 940MX variants, as well as Intel’s UHD 620 alternative. 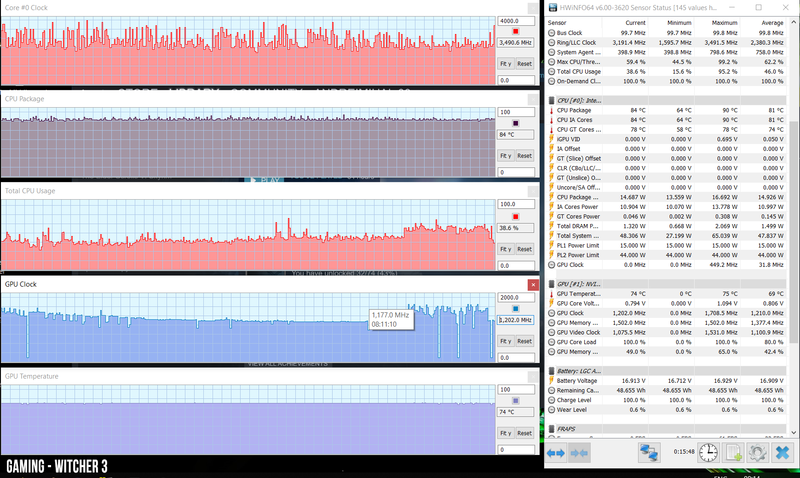 It should come to no surprise that the performance gains are small over the MX150 1D10, as the MX250 is pretty much a rebadged follow-up of the same Pascal GP108 chip. 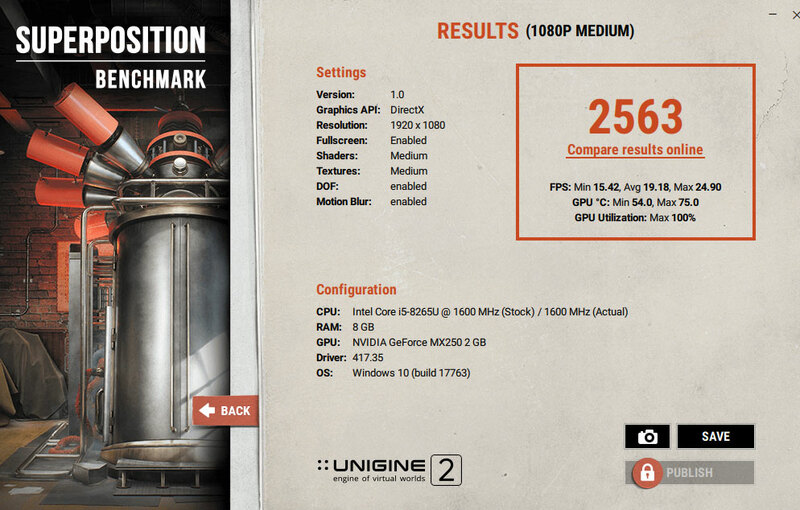 The performance gain over the Intel UHD 620 eGPU, on the other hand, is significant. 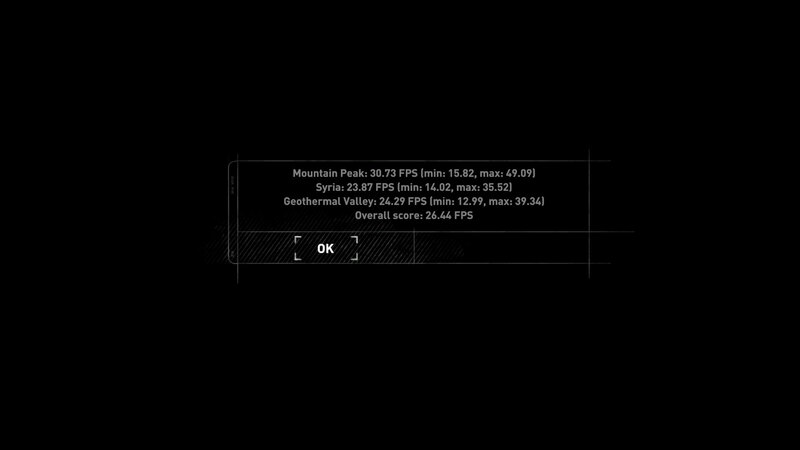 As far as gaming goes, we ran a couple of DX11 and DX12 games on our test-unit, on FHD resolution and Low/High details, and compiled the results in the following table. 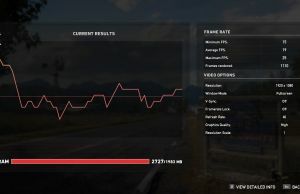 Most of these are highly taxing games, thus you’ll have to lower the graphics settings and even the resolution to play them on an MX250 laptop. 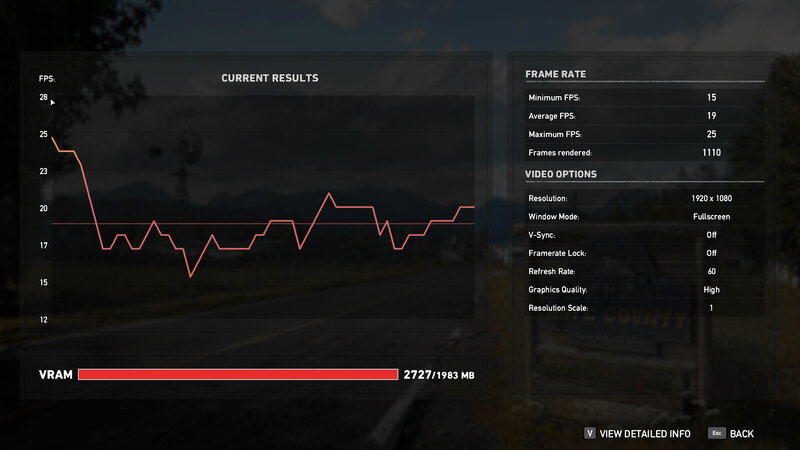 However, older titles and casual games (Overwatch, CS, Minecraft, Dota 2, Fortnite, Rocket League, etc) will offer 30+ fps at FHD resolution and Medium settings. 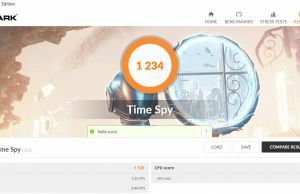 The following table further compares the gaming-results of the MX250 1D13 inside the Aspire 5 A515 with several ultraportables based on MX150 chips: the Asus ZenBook UX433 (MX150 10De 1D12 GPU), the Asus Zenbook UX331 (MX150 10De 1D12) and the Acer Swift 3 (MX150 10De 1D10). 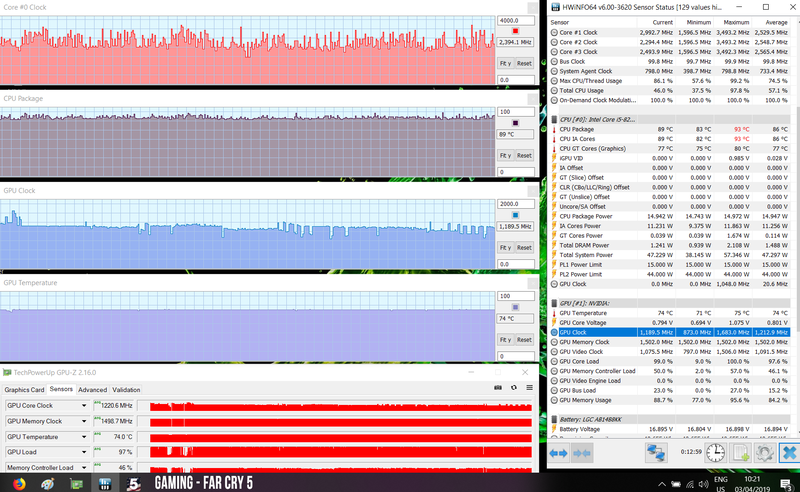 All games were tested at FHD resolution with High details, and here’s what we got. 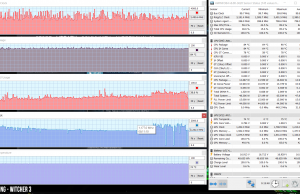 Based on these results, the Aspire 5 A515 pretty much matches the MX150 1D10 powered Swift 3, which again, comes to no surprise. 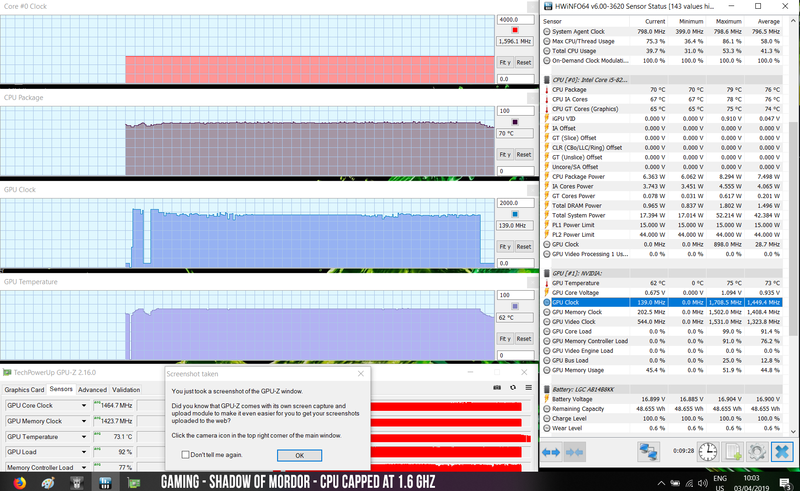 I would, however, expect later software updates to squeeze a 5-10% fps count increase. 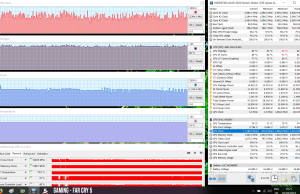 That aside, higher-tier laptops with MX250 graphics are going to fare better in both benchmarks and games, as the cooling inside the Aspire 5 does not allow the GPU to run at high clock speeds in longer gaming sessions. 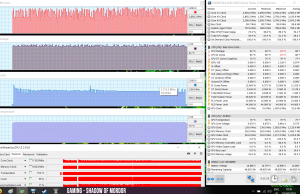 The HWinfo logs below show that the GPU is thermally throttled to frequencies of about 1.2 GHz in demanding titles, down from its maximum Turbo Frequency of around 1700 MHz. 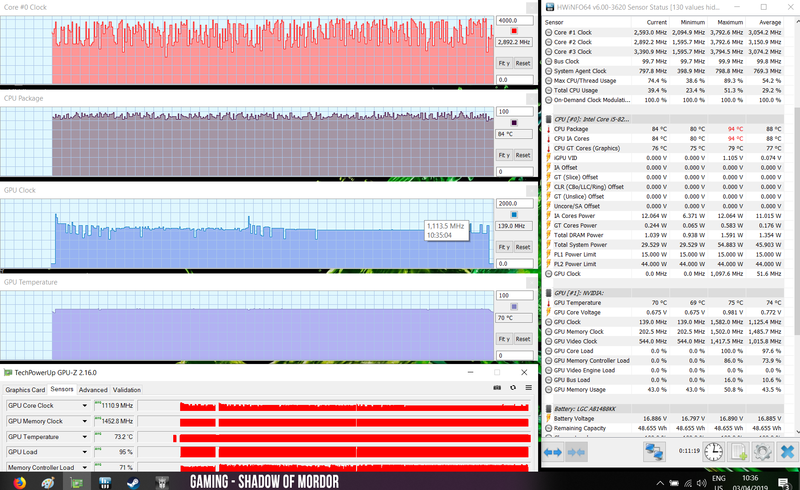 However, capping the CPU to base-clocks in Throttlestop allows the GPU to run at higher frequencies of around 1450 MHz, as shown in the following log, which demonstrates that the MX250 can actually offer 10-25% better gaming results with a more complex coolign design. You’ll have to dig through reviews, though, in order to find out how each implementation performs, just like with the older MX150 devices. 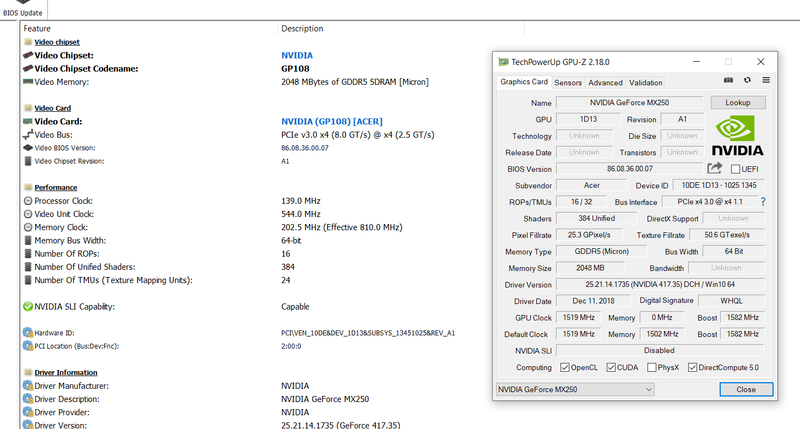 As a reference, the MSI PS42 and the Razer Blade Stealth, both with two fans, multiple heatpipes and significantly more expensive than the Aspire 5, were some of the faster implementations of the 25W MX150 chip in the past, and I’d expect their potential MX250 updates to perform just as well. On top of that, hopefully, other OEMs will also offer new competitive designs in the months to come. 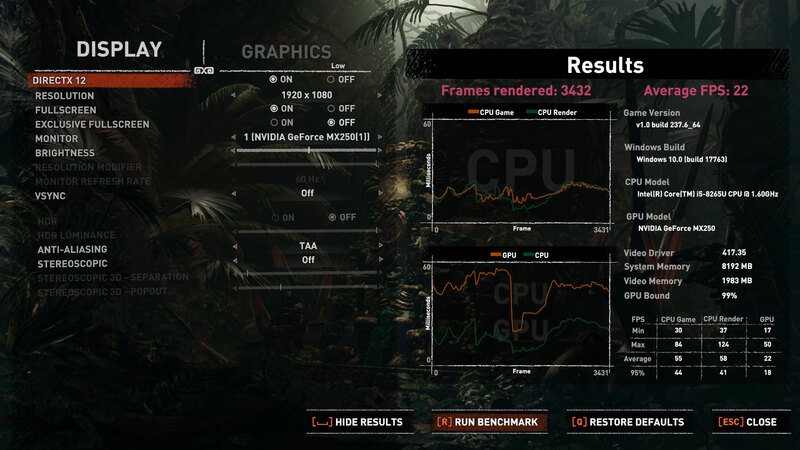 Bottom point though, while you should take our findings with a lump of salt, as they are based on an early MX250 implementation with immature drivers and a basic cooling design, there’s little doubt about the fact that the MX250 GPU will only offer minor performance bumps over the MX150 implementations we’ve seen throughout 2017 and 2018. That means that if you already have an MX150 laptop, it will make very little sense to upgrade to an MX250 device, unless there’s something else that draws you towards the newer model. 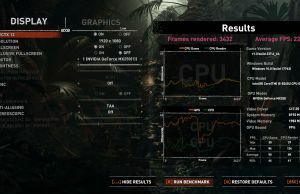 However, if you’re shopping for a compact and light 13-14 inch laptop in 2019 and first part of 2020, or an affordable (and usually still compact/light) full-size 15-inch notebook, that can still run some casual games or help accelerate your GPU dependent tasks while on the go, chances are you’ll find good value in one of the available MX250 laptops. You might also find great value in the existing MX150 options though, as you’ll be able to find those at discounted prices, as long as you’ll still find them in stock.